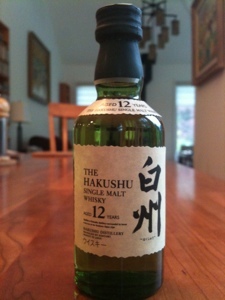 The Coopered Tot: Hakushu 12 is delicate and fruity, but also spicy with a whiff of smoke. 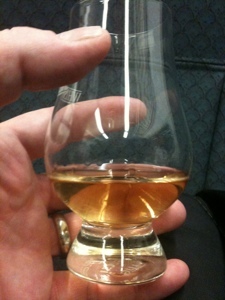 Hakushu 12 is delicate and fruity, but also spicy with a whiff of smoke. "Half a century after the Yamazaki distillery was founded, Keizo Saji inherited his father's vision, and in his quest for innovation, constructed Suntory's second distillery in 1973. The flavor signature, according to Suntory is: "Straight from the untouched forests, mountains, and pure waters of the Southern Japanese Alps, it is no wonder that Hakushu is a "green and fresh" whisky..."
"Green and fresh", what does that mean? Nose: honey, honeysuckle flowers, green pear, phenol, orchid, oatmeal cookies baking. Pointedly, intensely, sweet and floral and full of the classic Speyside and Highland fruit basket aromas. Less lushly vanilla and citrus heavy than Yamazaki; lighter and more floral than fruit. Entry is sweet and lushly floral and honeyed. Mouthfeel is light but still silky - not thin. The mid-palate comes on with some peppery heat and is malty, firm & rich with pineapple, butter, cream, honeyed oats, a musky hint of peat and some jujubes and juicyfruit gum Finish has a gentle bitter note, and faint sweetness like faint flavor memories of a finished butterscotch candy. A few drops of water reduces the fruit basket nose and ups the musky and almost smoky aspects. It also makes the sweetness up front more pointed, unleashes some spicy heat at mid-palate, and emphasizes the oak flavor note in the finish. The spicy mid-palate seems to be a constant feature of these Suntory malts. I imagine that this is the influence of the Japanese oak, and I like it. Yamazaki and Hakushu are clearly kin, reflected in the Highland-like fruitbasket notes they both share. However Hakushu wears its high altitude on its sleeve in its comparative lightness and delicacy. Colder high altitude sites have slower maturation leading whisky to have a lighter more delicate character that whisky aged for the same amount of time in a warmer climate. This explains the "fresh". I'm not so sure what is meant by "green". Perhaps the smoky notes remind of woodland fires? Or maybe the green flavor notes of the pear and the phenol? I don't know and I don't really care. Hakushu is another delicious success. It's less effusive and obvious than either Hibiki or Yamazaki; less tropical and lush. Instead it has more delicacy - with gentle and complex flavors that take a bit more introspection and time to explore but just as much rewarding detail and complexity to find when you do. On a celebratory note today, Saturday May 26, 2012, The Coopered Tot passed the 10,000 hit mark. A big thanks to the whisky dedicated from around the world who have taken the time to visit this blog and put up with the verbose and long winded verbiage that spew forth from the sparks and friction of my travel along my whisky journey. Tasting this again tonight I'm struck by Oliver Klimek's tasting note "pineapple". Now I cannot sniff or taste Hakushu 12 without remarking "oh yes, pineapple". Plus, now I might give it five stars. Amazingly good.